Clarity, the platform where entrepreneurs can schedule phone calls with mentors, announced $1.6 million in funding today led by Baseline Ventures, Freestyle Capital, and Mark Cuban. “We wanted the product from day one to build a bridge between different geographical locations for great advice, and we did the same thing with our investors,” says founder and CEO Dan Martell. The round also included top Canadian investors like Gerry Pond, Real Ventures, and Version One Ventures. Clarity has a directory of over 7,500 mentors who are willing to offer advice, sometimes for a fee. Entrepreneurs can search mentors by expertise, and see information on how many calls they’ve taken, average call length, and average response time. The New Brunswick startup will be using the additional funding to hire new team members and expand internationally, providing support for Spanish and French. It’s important to have local mentors available, says Martell, because they can provide relevant connections and context; raising money in Des Moines, Iowa, is different from raising money in New York City. 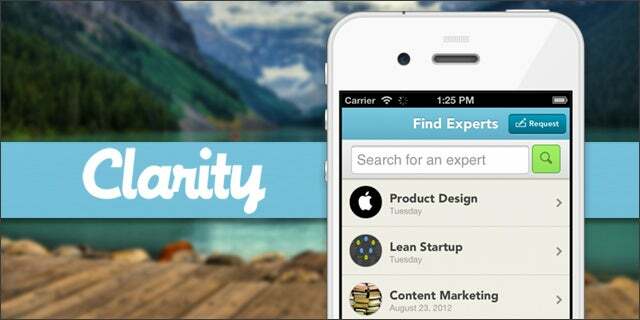 They also launched a new feature called Clarity Needs. If you don’t know the right mentor to call, you can post an area of expertise – like marketing or customer development – and get recommendations from expert Clarity users for mentors to call. Over time, Clarity can use these recommendations to help classify mentors into areas of expertise. Finally, Clarity started a blog that aims to ease some of the malaise around cookie-cutter, rah-rah startup advice. It will tackle the topics that many entrepreneurs want advice about, based on entrepreneurs’ needs and feedback from mentors. It will also give publicity to Clarity startups – another bonus to a site that’s already free for entrepreneurs.